World Stroke Day | A Savings WOW! Today is World Stroke Day and sharing information about it is something that is important to me and my family. My husband had a stroke last May and our family has been forever changed because of it. We were on vacation when it happened. He had always been a pretty healthy person – doesn’t smoke, doesn’t drink, etc., so it came as quite a surprise to us when it happened. He had a hemorrhagic stroke, losing all feeling on one side of his body, and affecting his speech. Through almost a year of intensive physical, speech, and occupational therapy, he is doing a lot better. However, he still has weakness in one of his legs, so he now walks using a cane. We, as a family, have grown closer because of the experience and have learned how to pitch in to do the physical things that he may not be able to do right now. I’ve always appreciated my husband and I appreciated him even more when I ended up having to do the snow blowing and shoveling during our terrible winter last year. Our kids have had to make adjustments on what they knew as our life before the stroke. I am very grateful that my husband has kept a positive attitude and has willed himself to do the things needed to continue his recovery process. I am also grateful that our kids have been strong, patient, and loving throughout everything they’ve experienced in their young lives. We also appreciate the support we have received from family, friends, and strangers, that made our lives easier as we navigated through the changes in our lives. We know that this is a long-term recovery process and are ready for the journey ahead. 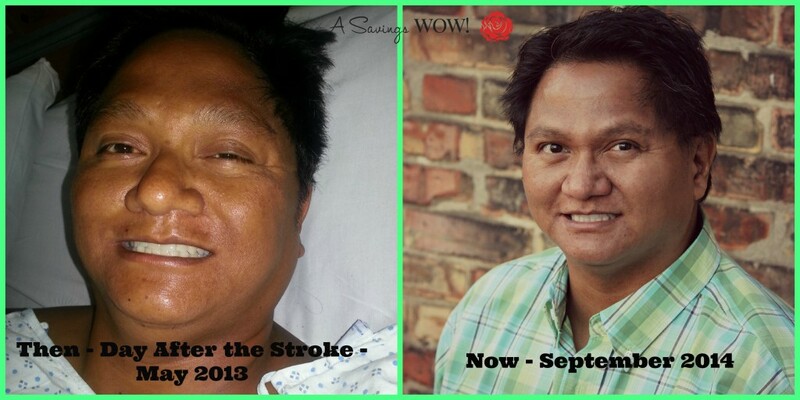 Here’s what my husband looked like the day after his stroke and what he looks like today. Someday I’ll have time to sit down and write a post about the time in between and what it took for him to get from point A to point B. – Time is critical. Make sure to call 9-1-1 immediately when you see these signs. Have you been affected by stroke? We’d love to hear your story. Strokes are scary things. Knowing the warning signs is so important. My mom has had a few mini-strokes and her speech and thinking were temporarily slowed down. Temporary meaning months… but she did bounce back. I think it’s critical to spread awareness. The signs and symptoms of a stroke are so important to know. My dad had a TIA and they said that he could have a big stroke in the future, so we have to be prepared. Doctors think my dad suffered from a mini stroke a couple years ago. It’s such a scary ordeal and I hate how debilitating strokes can be. Thanks for bringing awareness about strokes. I didn’t know what to look out for until now. I am glad your husband is doing better. Wow good to know! My grandfather suffered strokes before he passed, as did my mom in her final stages of cancer. Very important to be aware! I appreciate you bringing awareness to this. Your husband looks like he is recovering well! It so important to raise awareness about the signs of a stroke. Time is so important when a stoke is happening. Great post. These are definitely good signs to look out for. Whether that is for yourself and you think you might have had a stroke or for other family members. Wow, thank you for sharing this post and bringing awareness to this. Strokes affect a lot of people and their families. Bless you for having to live through such a scary event! Thanks for sharing these warning signs too! My grandmother had a stroke at my cousins wedding. I know over the years people i know have had them. It’s such a scary thing. I have always worried about this! Thank you for the warning signs. I have never personally known anyone that has had a stroke, but it is so important to know the signs. Time is critical when you are having a stroke! Thanks for this. So important to know the signs of a stroke and what to do. I didn’t know there was a National Stroke Day. Your husband looks great now, I’m so very happy he made it through. Stokes are tricky, it’s hard to tell sometimes if someone is having one, or you yourself might not even know you’re or have had a stroke. I’m glad there is a day to help spread info on strokes. It’s always good to be educated when it comes to things like this. These are great signs to look for! Strokes are scary and it’s great to know the early signs of it and seek medical help immediately! Thanks for sharing this with me. My husband too had a life-changing illness last year so we’ve had to overcome a lot. My children were a little too young to realize what was happening but it was very scary for me. He spent 21 days in the hospital. I’m glad your husband is doing much better! Thanks for sharing this incredibly valuable information! I never really knew how to recognize the symptoms of a stroke. Fortunately, no one I know has ever had a stroke. But it is always good to know the signs of one. I had a mini-stroke when I was 22 and I’ve had a few since then. It’s so important to know the warning signs and to get help immediately!!! I wish continued improvement for your husband and thank you for your update on strokes. They are very scary as I’ve had many friends have strokes who weren’t considered old at the time. Strokes are really devastating. My father in law had one in 2009 and he was never the same. Your husband is blessed that he looks fine now. But my FIL really struggled with speech for a long time and never really quite regained his previous strength. It doesn’t help that he’s very stubborn, but to his credit, I think he did try. However, you’re right that it helps a lot when one has the love and support needed from close family and friends. Thank you for sharing this! Great post! Thanks for sharing the warning signs it’s a very scary thing. I hope your lives get easier and thankyou for sharing your story.